Aloituspaketti Warhammer 40.000 Primaris Ultramarines maalaamiseen. Mukana 3 Intercessors -miniatyyriä, 6 maalipurkkia sekä yhden pensselin. 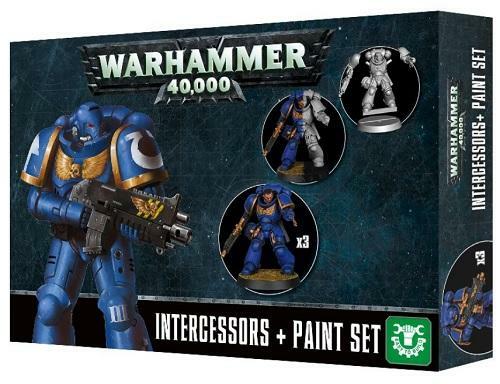 The perfect way to start a collection of Primaris Ultramarines, this is a box containing 3 plastic Easy To Build Primaris Intercessors, the paints you need to paint them and a brush to get you started. The miniatures – 2 Primaris Intercessors and a Primaris Intercessor Sergeant – are each armed with a bolt rifle and carry frag and krak grenades, with one holding an auspex with a detailed keypad and display. The Sergeant has a unique bare head, with his detached helmet mag-locked to his belt, and features extra details such as a reliquary and holstered pistol.